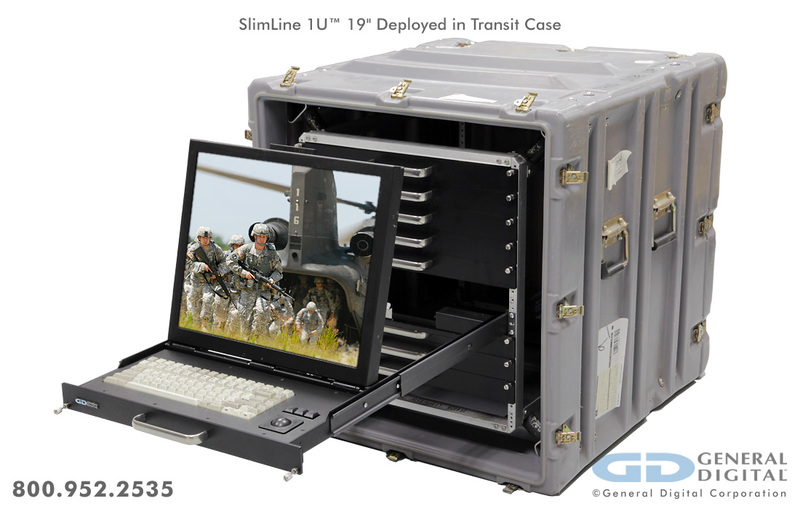 Since its release in 2001, General Digital’s SlimLine 1U was designed in-house to meet the physical, mechanical and environmental rigors of military and industrial environments. 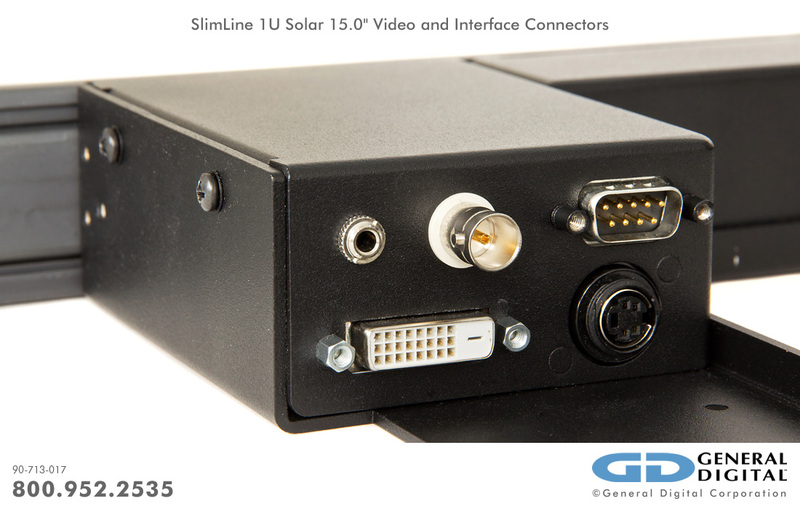 We work with you to configure and build your SlimLine 1U monitor to meet your precise needs. Furthermore, we offer a wide range of practical options for you to custom design your unit. 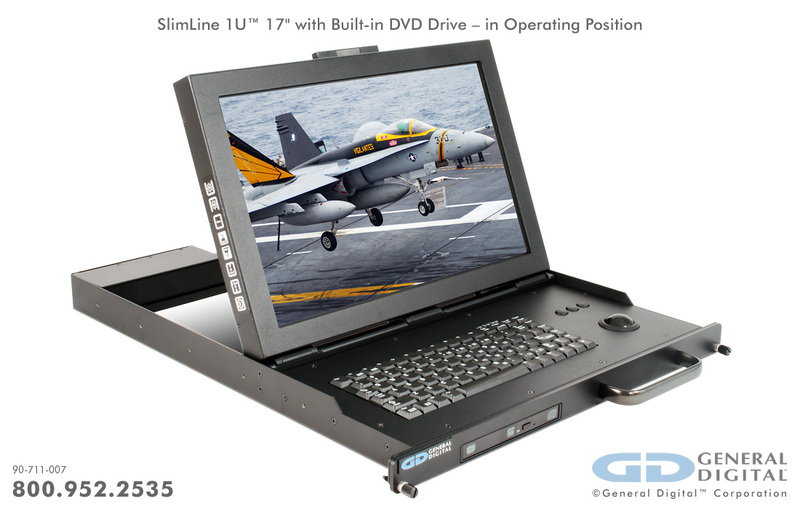 The SlimLine 1U has an extremely low profile, occupying only one vertical rack unit (1U = 1.75"/44.45 mm). 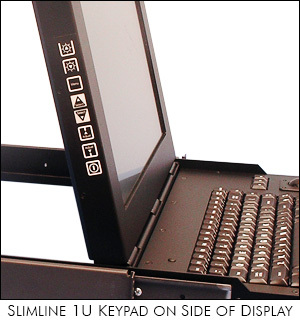 It achieves this ultra-low profile by tilting an LCD from behind the keyboard, such that the display lies flat (facing upward) and behind the keyboard when stowed in the rack. 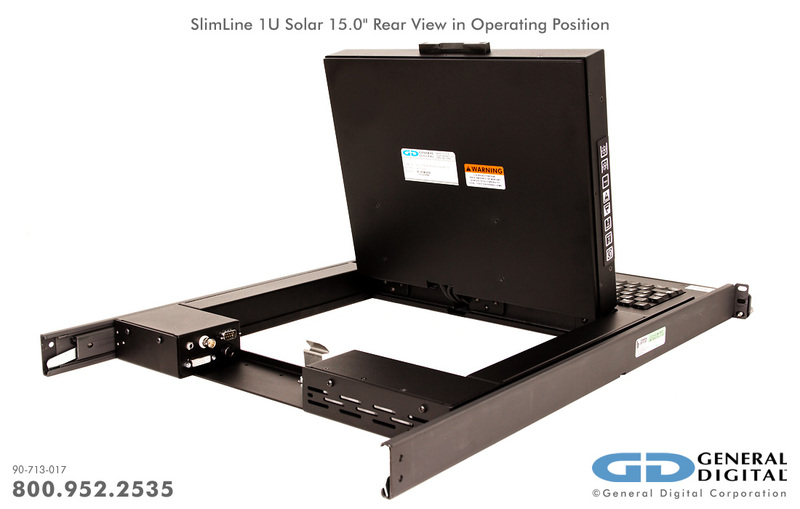 A pair of solid-bearing chassis slides facilitates the mounting of the SlimLine 1U into a rack chassis, and stowed out of the way in space-constrained environments. 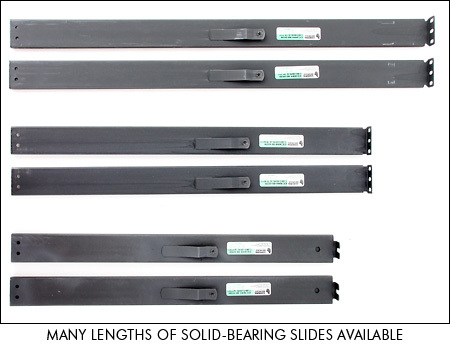 Normally, the slides are installed as a standard set in even lengths (e.g., 20", 22", 24"). However, in the event that a customer requires special functionality or extension lengths, we can provide custom slide assemblies (at additional cost) as a non-standard combination of the rails. 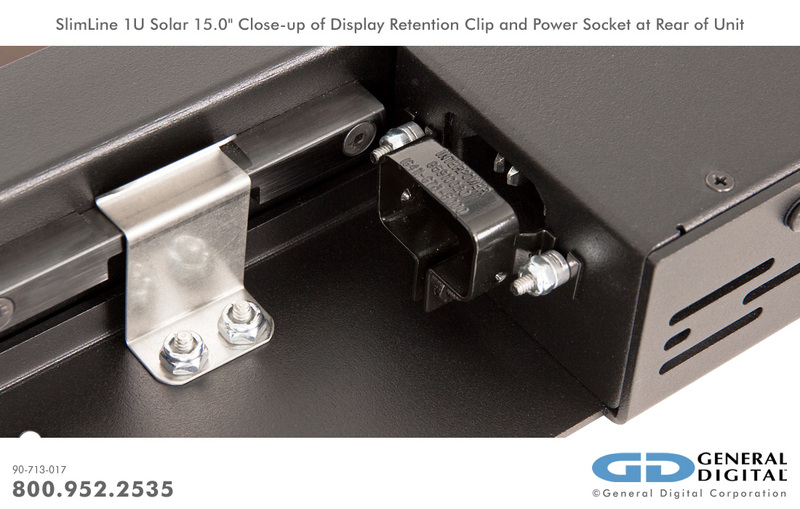 A spring coil latch and machined handle firmly secure the display in its stowed position. 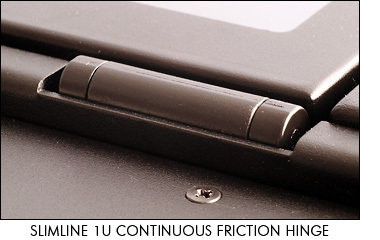 The LCD hinges upward on continuous friction hinges such that it can be positioned at virtually any angle that the operator desires, from 0 to 90+ degrees. Interface connectors on the SlimLine 1U are located on a pair of connector panels located at the rear of the main enclosure, on either side of the display head assembly. 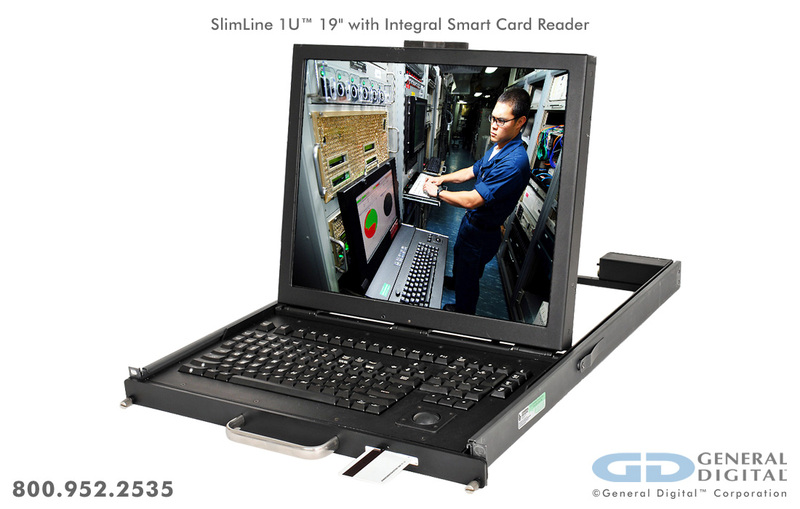 The SlimLine 1U can be configured with a variety of standard or custom On-screen Display (OSD) user controls, including membrane or silicone keypads. Some models can be configured to provide NVIS compatibility, LED backlighting or configured with electronics that allow backlight dimming. 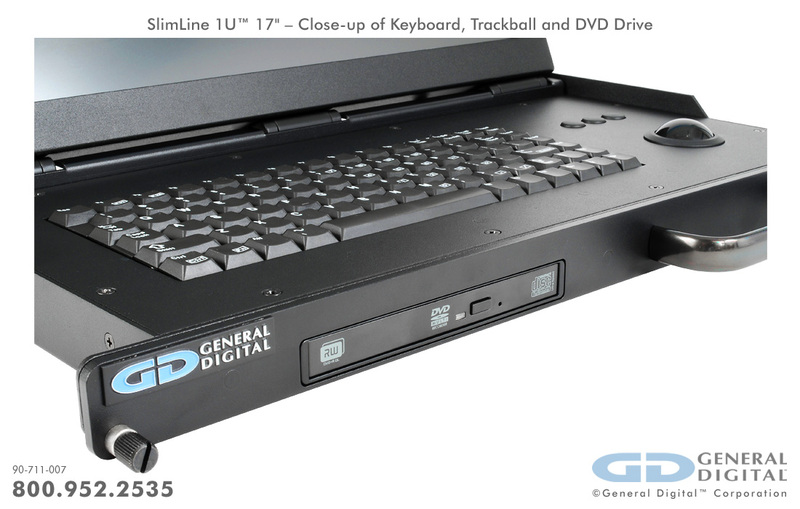 Below is an overview of typical General Digital SlimLine 1U Series model numbers. Having a good understanding of the structure of our model numbers will help you configure your monitor. 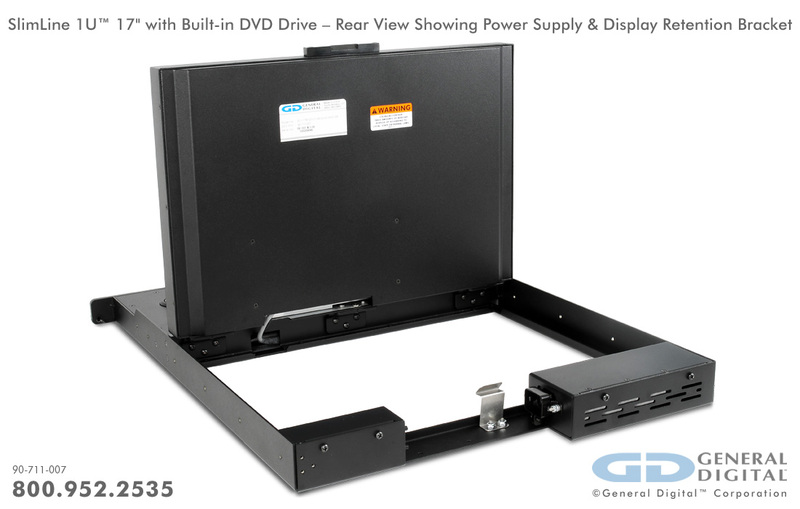 The SlimLine 1U enclosure has been carefully designed to allow our engineers to modify/customize the existing designs to accommodate a limitless variety of display size/resolution combinations. 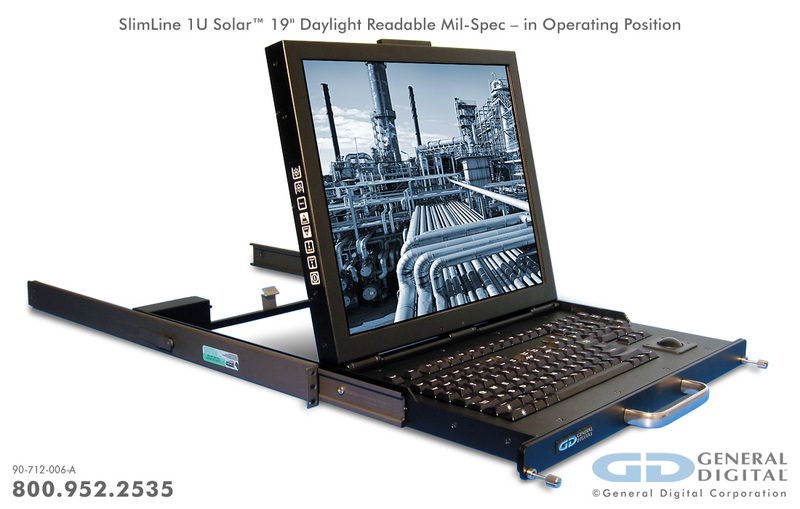 Customers greatly benefit since they can request virtually any OEM LCD of their choice for integration, or select from an evolving list of value-added Genflective, Sunlight/High Brightness or NVIS-Compatible enhanced LCDs. 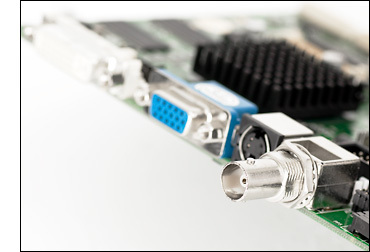 Below are listed the most popular video controllers for use with the SlimLine 1U Series. Please inquire with a Sales Engineer for more information. 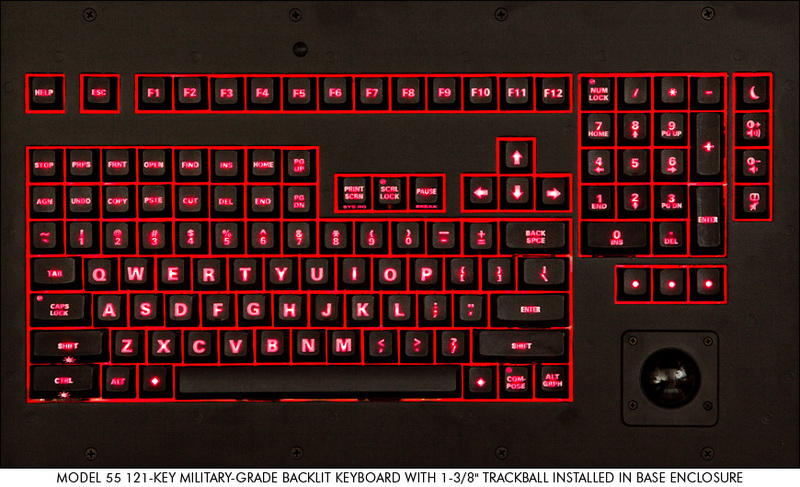 Below are listed our most popular keyboard configurations for the SlimLine 1U. 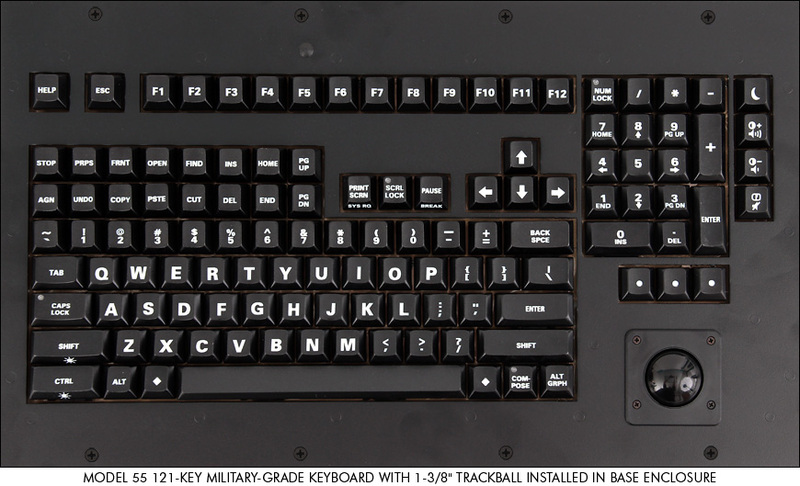 All military-grade and industrial-grade keyboard electronics, switch activators, optical pick-ups, bearings and connectors are protected against dirt, dust, liquids and general contamination. Please consult a Sales Engineer to discuss your specific requirements. 3 Requires extended rack drawer, which increases the depth by 2". 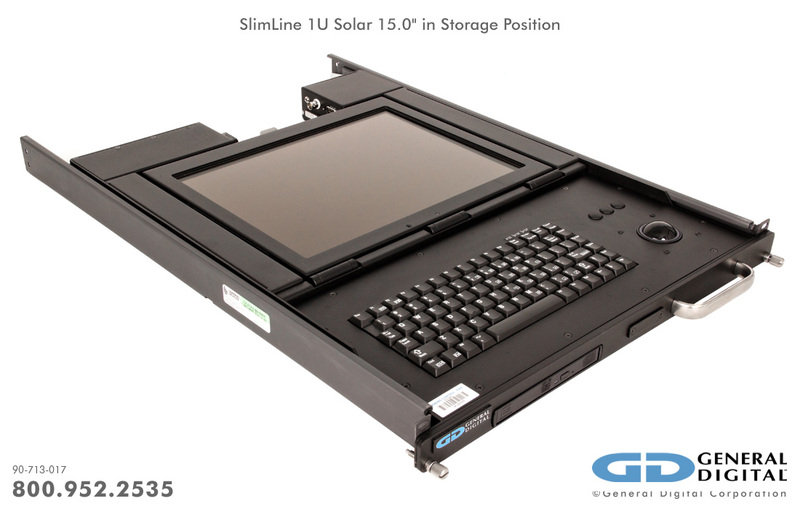 WUXGA: 1.75" (1U) x 19.00" x 22.00"
The SlimLine 1U Series is highly configurable. There are many overlays that can be added in front of or behind the LCD to improve its performance. Please speak with a Sales Engineer to select the right overlay for your budget and performance requirements. 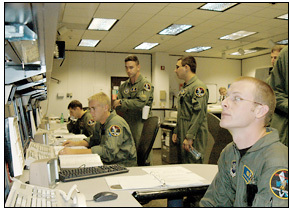 Note that a unique numerical identifier will be assigned depending on the specific overlay(s) selected. Download our full list of assigned overlays available. 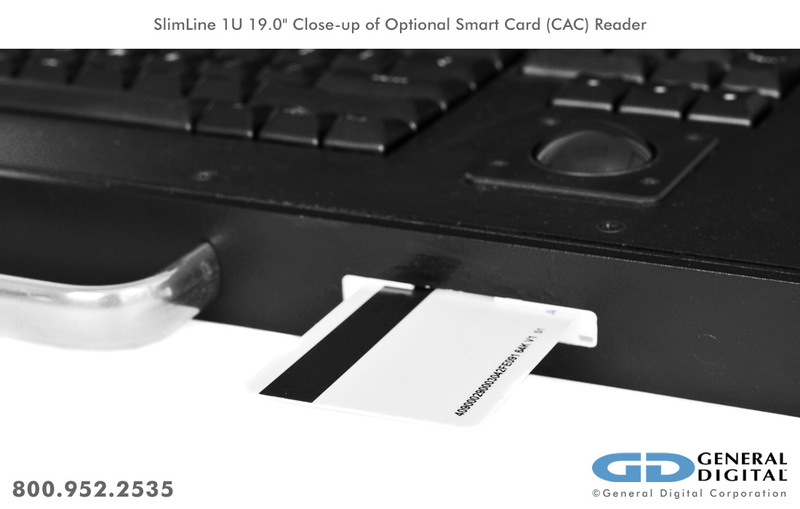 The SlimLine 1U Series has certain limitations on the display overlays available, as detailed below. Please speak with an Applications Engineer for more information. All displays can be optically bonded. 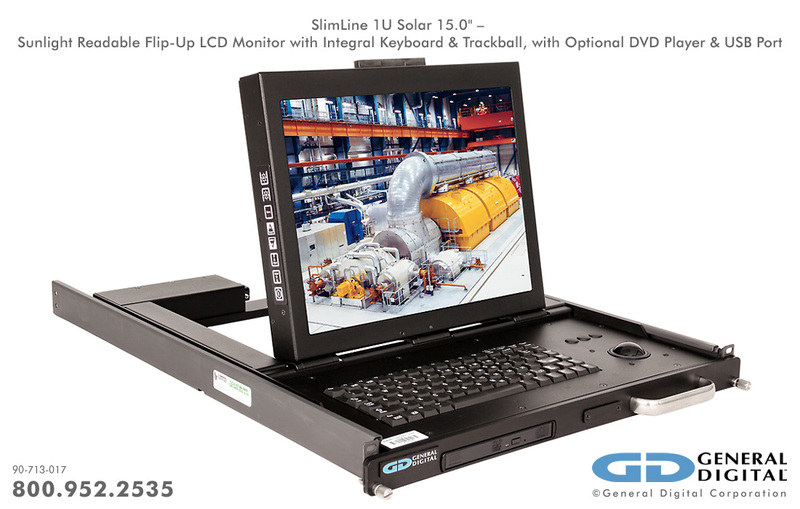 1 Since the SlimLine 1U Series does not include an embedded power supply as standard equipment, we strongly recommend the purchase of a General Digital-manufactured power supply, which is specially designed and tested to work with our LCD monitors. Please note that these supplies include the required DC harness and connector to interface to your SlimLine unit. 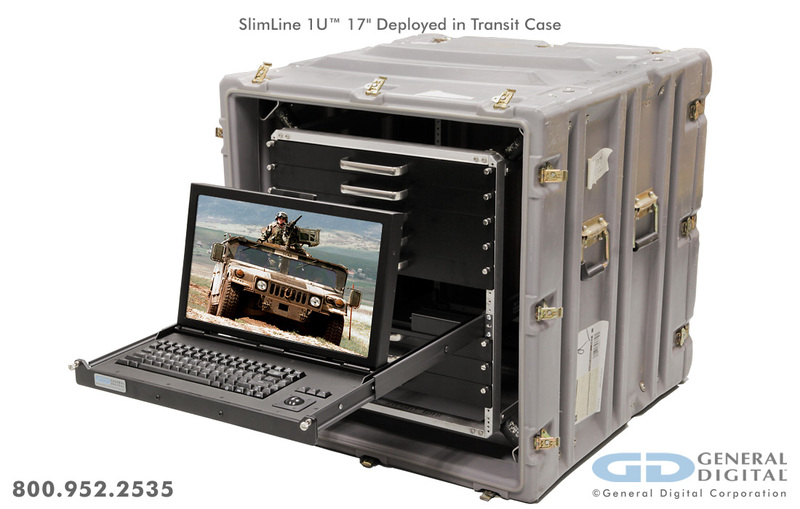 The photos below represent a small sampling of General Digital’s standard and custom SlimLine 1U LCD monitor-keyboard rack drawers. 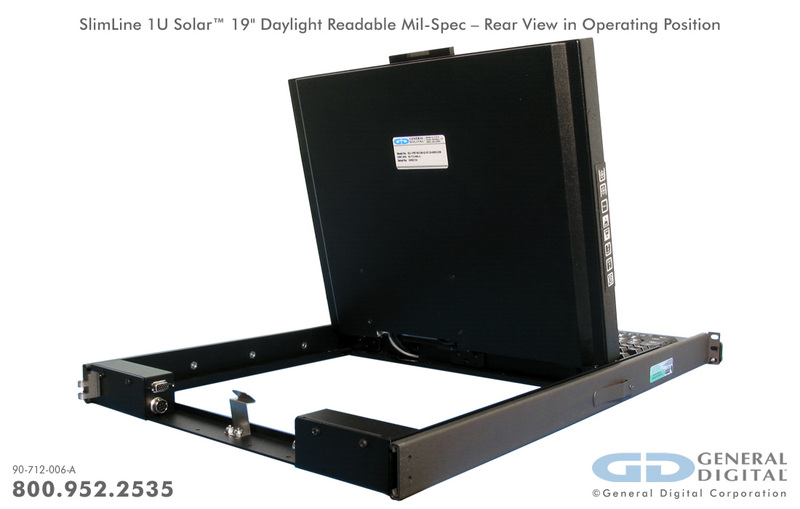 They serve to illustrate the many display sizes and mechanical configurations we offer, as well as standard and custom design features, capabilities and options. Click the thumbnails to view full-size photos. 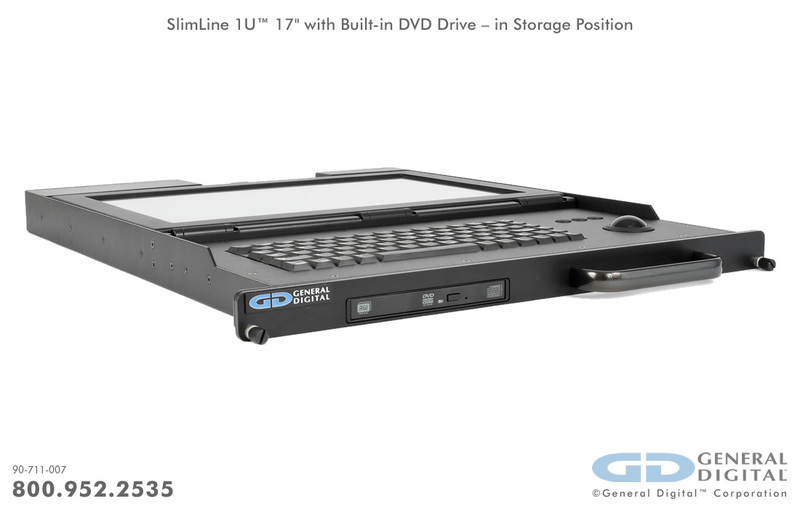 Watch the videos below to learn more about our SlimLine and other LCD monitor-keyboard rack drawers, as well as the display services General Digital offers for most monitors, whether built by us or another manufacturer.